The rapid progress of wireless communication, sensing, and mobile technologies has enabled students to learn in an environment that combines learning resources from both the real world and the digital world. It can be viewed as a new learning style which has been called context-aware ubiquitous learning. Most context-aware ubiquitous learning systems employ expensive sensing technologies, such as Radio Frequency Identification (RFID), to detect the real-world learning behaviors of students and to provide personalized learning guidance accordingly. 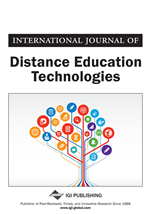 In this paper, the authors use QR (Quick Response) code, a low cost technology that is available on smart phones for detecting students' real-world learning status. Moreover, Web 2.0 technology is employed to enable students to collaboratively build a learning materials database. An experiment was conducted to investigate the relationships between the system quality, personal factors, learning motivation, perceived usefulness, and perceived ease of use, learning attitude, and behavioral intention of the students. In addition, from the interviews, it was found that most of the students felt interested in learning with the system and considered it as a helpful learning tool. In recent years, due to the popularity of the Internet, various online systems and applications such as Web 2.0 applications and Internet-based learning technologies have been developed. In the meantime, web-based learning has been identified as being an effective way of learning (Chen, Chen, Liou, & Kuo, 2010). With the advance and popularity of wireless technologies, the form of network service is changing from wired to wireless. Moreover, many kinds of mobile devices, such as PDAs (Personal Digital Assistants) and smart phones, have been developed and have become increasingly popular, thus enabling a new way of learning, that is, mobile learning (m-learning) or ubiquitous learning. Recent mobile learning research has shown that ubiquitous mobility and situated context are the important features in successful mobile learning activities (Jeng, Wu, Hung, Tan, & Yang, 2010). With the benefits of ubiquitous mobility, students can easily join learning activities in the real world and connect to their peers via wireless networks. Researchers have further indicated that ubiquitous computing technologies (e.g., sensing devices) can be integrated with mobile computing and wireless communication technologies to develop a context-aware ubiquitous learning (U-learning) environment (Landt, 2005; Hwang, Tsai, & Yang, 2008) in which students use mobile devices (e.g., PDAs or smart phones) and sensing devices (e.g., RFID or QR code) to learn in real-world environments (Chu, Hwang, Huang, & Wu, 2008; Hwang, Tsai, & Yang, 2008; Laru & Jarvela, 2008; David, 2008). When the students use their mobile devices to detect QR codes or RFID tags on the learning targets, the learning environment delivers situated context to the students via the wireless network and their mobile devices. Such a learning approach shifts technology-enhanced science education from in-class learning to in-field learning. For example, several studies have found that the learning in real-world scenarios not only improves the learning performance of students, but also helps them better adapt to dealing with similar problems that they may encounter (Brown, Collins, & Duguid, 1989; Hwang et al., 2008; Resnick, 1987). Among various learning theories, constructivism emphasizes that knowledge is constructed by the learners themselves, not passively instilled by the outside world (Zull, 2002). Researchers have indicated that technologies might not benefit students during the learning process, unless the students can use them for constructing and organizing knowledge rather than for merely accessing learning content. Accordingly, the role of the teacher needs to be changed from an instiller of knowledge to a counselor guiding students to learn (Shen & Hwang, 2012). Web 2.0 is such a technology that enables users to actively share information rather than just receiving it. In this paper, the concept of Web 2.0 is adopted to implement a learning system based on the constructivism theory to enable students to share information acquired via mobile phones, including photos of and texts about plants. The system is able to assist students in producing QR codes for individual plants, so that the learning materials which they themselves have uploaded can be browsed by other students via scanning the corresponding QR codes with mobile phones. Such a learning design not only engages students in observing and describing the target plants, but also encourages them to organize and share the photos and descriptions of the plants. It is expected that the students’ ability of presentation and knowledge organization can be fostered accordingly.